You know you're talking about an obscure roleplaying game when it's nigh impossible to find a stock image of its cover. Mind you, until very recently I wasn't 100% certain Mach: The First Colony had ever been published. I remember seeing advertisements for it in many issues of Dragon back in the early '80s and I thought it looked intriguing, but I never saw it on the shelves of any game store I visited. The artwork of the advertisement, coupled with the tagline "A role playing game of soldiers of fortune in a New World," made it seem right up my alley. I've long thought that a RPG taking inspiration from the European exploration and conquest of the western hemisphere had potential. Strangely, comparatively few games have ever done this, so perhaps I'm alone in thinking this way. Regardless, the way Mach (originally published in 1983) presented itself in those Dragon ads of old made me think that perhaps it might be the game I was looking for. So, when I saw a cheap copy on eBay recently, I snapped it up greedily and awaited its arrival with anticipation. Never having seen Mach "in the flesh," so to speak, I had no idea what to expect. I had only my teenaged memories and my own fevered imagination to draw upon and, as I've learned over the years, it's rare that reality holds up to one's long-held expectations, especially expectations formed long ago and without a firm foundation. 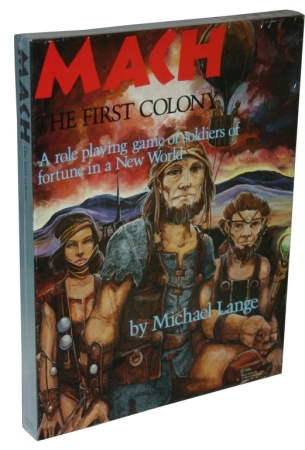 Mach appears to have been the brainchild of a single person, Michael Lange, in whose name the game is copyrighted and who wrote two of the three short books included in the boxed set. There are no credits listed anywhere in the game, so I can only assume that Lange is also responsible for the numerous black and white illustrations found throughout. That's, frankly, one of the most remarkable things about Mach; the game has a unified and interesting esthetic that makes it stand out when compared to what most RPGs looked like at the time of its publication. I found myself reminded of Jorune, which only makes sense, as you'll see. The "New World" mentioned in Mach's tagline is literally true. Despite appearances to the contrary, Mach is not a fantasy game but a science fiction one. It postulates an alternate reality where, in the 1970s, alien beings called the Abla arrive on Earth and explain that cascading supernovas would soon destroy the planet. Being incredibly powerful and benevolent, the Abla offered to transport as much of Earth's population as they could, along with some Terran animals, to another planet, called Mach, safe from the supernovas' destruction. The Abla explained that Mach was not uninhabited and that humanity would be sharing it with three other humanoid species: the Bane (large, strong, and dimwitted), the Palir (psychics), and the Tofus (highly intelligent and diplomatic). The Abla stipulated that no firearms or schematics for such would be transported to Mach and asked humanity to avoid interfering with the development of the other races. Naturally, the Abla's plans didn't work out and humanity cleverly circumvented all of their stipulations. Within 200 years of arriving on Mach, mankind had spread across much of Mach, enslaved the Bane, learned psychic "sorcery" from the Palir, and began to make firearms again. This resulted in wars and upheavals that shook the planet, creating an unstable situation that only became more unstable when evidence of an ancient Machic civilization is unearthed -- a civilization with extremely high technology. Where are the Abla in all of this? Good question. Mach doesn't really explain what happened to the Abla; they seem to disappear from the scene after saving humanity. I found this odd, though not surprising, since their continued presence would have been a hindrance to the kind of setting the game's creator clearly wanted. Rules-wise, Mach comes across as a fairly typical '80s RPG: highly detailed and overly fond of tables. The game system itself is nothing special -- skill-based and percentile dice-oriented. There are lots of skills, though, many of which have their own subsystems for use. Because humans outnumber all other species by a significant number, playing another species is possible only if a player rules well on a random chart. The game provides a fair bit of detail on Machic societies and cultures, in addition to information on native and transported life forms. It's thus a fairly complete "tool kit" for the referee to use in creating his own campaign. Indeed, Mach is explicitly written to have no default setting except in the broadest sense. The referee is expected to establish the specific details of "his" version of the planet, right down to the locations of settlements and their relationships. Consequently, Mach isn't a very newbie-friendly game, a fact that it acknowledges several times. It's designed for "experienced" roleplayers looking for a challenge. Even given that, it stills seems to me to be incomplete as is, more like the sketch of an interesting idea rather than something more complete. Admittedly, I haven't played the game, so perhaps my initial impression is mistaken. Compared to other humans-transported-to-another-world games, like Empire of the Petal Throne or Jorune, Mach is a bit lightweight and its setting doesn't quite hang together. Throw in the needlessly complex rules system and it's a recipe for disappointment. I'd had high hopes that Mach: The First Colony was a forgotten classic of the hobby. Instead, it looks to me more like a labor of love whose enthusiasm far outstripped its content. Wow, I'd never heard of this one. Cool find, and good post. A "New World exploration" game has been in the back of my mind for a while now, so it's interesting to read about Mach using this concept as its central premise. I've been slowly putting together ideas for a campaign that starts out with the PCs literally stepping off of the boat onto the shores of the New World. Beyond a couple of colony outposts on the coast, it's terra incognita. I think combined with a good system for semi-randomly generating the map as the players explore, it could be really fun. Mark Smylie's Artesia also rises to mind here where the connection between the game and illustration can be very close owing to the author illustrating and having an intimate personal stake in the world. But sometimes, just having a single illustrator with talent, vision, and a sympatico with the source material can also work (viz Donna Barr illustrating Paul Kidd's Lace & Steel, or Eric Hotz illustrating much of Harn). exploration and conquest of the western hemisphere had potential. Strangely, comparatively few games have ever done this." Arguably, D&D is this situation in a pseudo-European world. This kind of setting, where it's like fantasy but every element has a science-fictional explanation, seems to have been very popular in the 80s. One example is Anne McCaffrey's Dragonriders of Pern series. James, I always enjoy when you bring up the more obscure RPGs from your youth. I bream with pride that I actually owned the game you talk about. But, with Mach you got me. I have absolutely no memories of this game. Wow, now this is one I've never heard of, and I thought I knew them all from back then. Fascinating. I've definitely never heard of this one before, and the premise (and the cover) are pretty interesting. Thanks for this post. I had this game back in the '80's. Sadly, I don't remember anything about it, which could be an indication of it's impression on me. Interesting. Never heard of this one. Not that I'm a be all and end all of Old School RPGs, but it being a sci-fi game, I'd surely have given it a look if I'd seen it on the shelves back in the day. For those of you thinking of a D&D style-setting with a New World bent, you might want to look at Role Playing Public Radio's New World Campaign PDFs. They're created to 4E, but frankly they're almost free of rules, and could be readily adapted to whatever flavor Fantasy RPG you wanted to use. I've been using the setting, albeit greatly modified, as the basis for my main group's Pathfinder game recently. I owned Mach: the First Colony back in the 80's. I don't remember very much beyond it being the only game I ever bought that I never even making a character for. I think that makes it unique among all the games that I bought but never played. alone in thinking this way." still active in the game writing biz. Good point about Artesia. Just a beautiful game both for its color illustrations by Smylie and it's background. It has a proud place on my shelf even though I've never actually played the game.